Richard Ingham studied music at York University, and completed a masters degree at Leeds Metropolitan University, researching into music technology applications with midi wind controllers. He is a member of the Northern Saxophone Quartet, with whom he has performed in Britain, Europe, the USA and Japan. He has broadcast and recorded many items of the solo saxophone repertoire, and has given recitals recently in Spain and Poland. He has presented masterclasses in conservatoires in the UR and USA, and in his capacity as a jazz educator gives many jazz workshops and lectures throughout the country. His numerous annual residential saxophone courses have proved very popular. He was a recitalist with the Northern Saxophone Quartet at the World Saxophone Congresses in Washington, Tokyo, Pesaro and Valencia, also as a soloist in Pesaro and Valencia. Richard is Visiting Professor of Jazz at the University of St Andrews in Scotland, and jazz and Twentieth Century music history tutor at St Mary's Music School, Edinburgh; he is a music festival adjudicator and specialist external examiner, and lectures at Leeds College of Music in England. 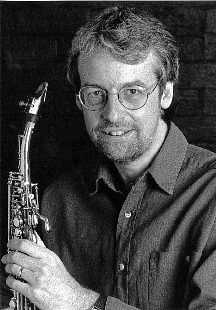 He was the chairman of the Clarinet and Saxophone Society of Great Britain (1989-92), is now a vice president of the Society, and co-directed the First, Second, Third and Fourth Fifth British Saxophone Congresses in 1990, 1992, 1994 1996 and 1998. He is the Director of the British Saxophone Ensemble. He is a Yamaha artist and clinician, and as well as his saxophone work, Richard has given many performances on the Yamaha WX7 midi wind controller. He has released several albums and numerous works have been written for him. He is the editor of the critically acclaimed Cambridge Companion to the Saxophone (Cambridge University Press, 1999). The programme is of music from the 17th, 18th, l9th and 20th centuries, some of which is played in a realisation from the 21st century. Following the theme of De Sax et des Autres , the music shows how Adolphe Sax's invention can be used to express musical ideas of wide historical and cultural diversity. Piobaireachd or Pibroch (Gaelic ceol mor - the "big music") is a highly developed form of Scottish Highland bagpipe music, dependent on closely worked variations, during which the complexity of grace note decoration becomes ever more elaborate. The MacCrimmon family of Skye were legendary pipers and composers. Piabaireachd Dhunnaombaig dates from the 18th century. Variations I was written by John Cage in 1958. Each performance differs, and is based on a realisation of lines and dots on transparent sheets, which govern the parameters of musical sound. Thus structure and content are largely products of chance operations - the result is a sequence of musical events, sometimes progressing, sometimes colliding. Hylta Dance (early 17th century) and Winyedepla (1803) are both "trowie" tunes in the tradition of Shetland fiddling, that is to say tunes mythically taught to islanders by the fairies. The set is completed by the modern composer Ronnie Cooper's Miss Susan Cooper. Shetland Island fiddlers play with a lift or backbeat quite unlike those in mainland Scotland. John Surman is one of the most influential baritone saxophone players in the history of jazz. His work on that instrument, as well as on bass clarinet and soprano saxophone, has provided an authentic European dimension to the history of jazz in the last thirty years. His work ranges from uncompromising extensions of the baritone range to tonal layering with sequencers. In Caithness to Kerry (from the north east of Scotland to the south west of Ireland) John Surman demonstrates his love of Celtic folk music.